AEROCAN had its roots in an operational and long-running Environment Canada (EC) network of hand-held (SONOTEK) sunphotometers led by Bruce McArthur. The development of a French network (PHOTONS) which employed an automated (CIMEL) sun-tracking sunphotometer and sky scanning instrument led to the creation of the GSFC/NASA AERONET (CIMEL) federated network which, in turn, inspired the creation of the Canadian AEROCAN network (a sub-network of AERONET). 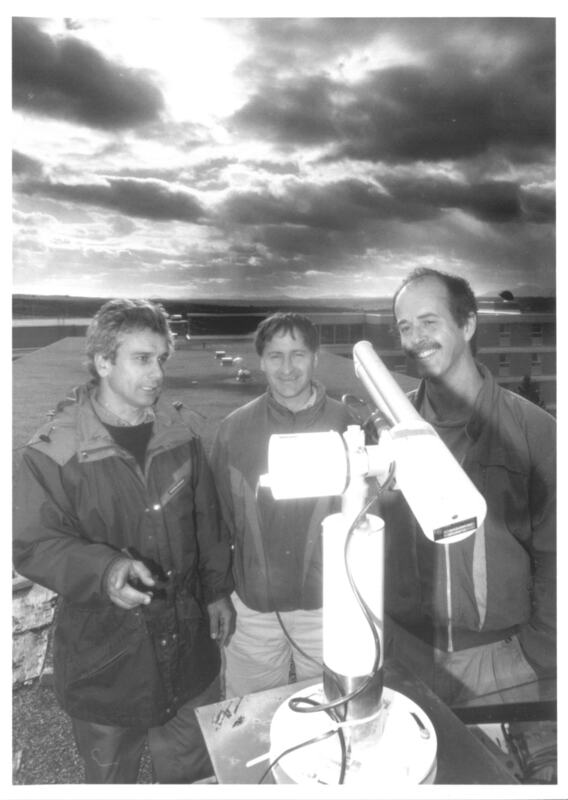 AEROCAN was co-founded in early 1997 by Norm O’Neill and Alain Royer from the Université de Sherbrooke as the result of a donation of 4 CIMEL instruments by Natural Resources of Canada (thanks largely to Phil Teillet and Gunar Fedosejevs at the Canada Center for Remote Sensing). Patrick Cliché at the Université de Sherbrooke was the first professional assistant to help with the network and was instrumental in getting the network off the ground. Jim Freemantle joined the network soon after and became a well known and much appreciated AEROCAN network coordinator for many years (he is still associated with AEROCAN through the Université de Sherbrooke and has been responsible for numerous network innovations). 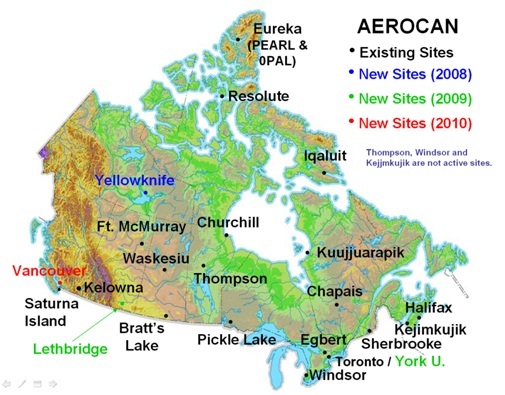 Previously existing Canadian AERONET sites established to support the BOREAS campaign were incorporated into the AEROCAN network. In fact, generous support from AERONET was instrumental in building a foundation for the current AEROCAN network and continues to this day. Environment Canada rapidly became more and more involved in AEROCAN via a partnership arrangement with the Université de Sherbrooke whereby EC (led by Bruce McArthur) took on the operational side of the network while the Université de Sherbrooke (led by Norm O’Neill) took on the responsibility of science QA and the preparation of AEROCAN data for near real-time ingestion into a future EC aerosol assimilation system. Ihab Abboud leads the operational group at EC and has ably brought AEROCAN into the 21st century with a current network of about 20 full time sites. Bruce McArthur, Norm O’Neill, Ihab Abboud and Jim Freemantle are members of the AEROCAN Steering Committee ( AEROCAN SC ) which meets annually to discuss technical, scientific and strategical issues related to the network. The most important AEROCAN changes in recent years include the rapid growth of the network (funded mostly by EC but also through a large York University / Université de Sherbrooke, Canadian Foundation for Innovation grant and various National Sciences and Engineering Research Council equipment grants), the preparation of AEROCAN data for near real time ingestion into the assimilation database (which in practical terms means a system switch from satellite transmission to internet transmission and the development of a high frequency, 3-minute mode for data acquisition), the development (still in progress) of an AEROCAN calibration site at Bratt’s Lake Saskatchewan (led by Bruce McArthur and Ihab Abboud), the inclusion of new Arctic sites in the network (notably a two-CIMEL site at the CANDAC-PEARL, high-Arctic atmospheric observatory in Eureka, Nunavut), and the implementation of a 24/7 operational lidar network (CORAL Net) developed by Kevin Strawbridge and his group from the CARE, EC site at Egbert, ON (at AEROCAN sites or, if not, the strategical plan is to expand AEROCAN to those sites currently without a CIMEL beside a CORAL Net lidar). Figure 1 AEROCAN Sites as of 2009. The current state of the network is shown in Figure 1. Selection of sites has been motivated by a complex combination of AEROSOL monitoring needs (operational and scientific), availability of secure space, availability of qualified site managers, presence of existing infrastructure (notably the presence of an EC monitoring site or, in a more specific example, the existence of the CANDAC PEARL observatory at Eureka, Nunavut), previous projects (for example the NASA BOREAS project of 1994 which began a long history of CIMEL sites at Waskesiu, Saskatchewan and Thompson, Manitoba), the presence of a lidar installation such as a CORAL Net, etc. Notable, long-term AEROCAN site managers have been Gerri Crooks at the Saturna Island (B.C.) EC site, David Halliwell at the Bratt’s Lake, Saskatchewan EC site, Staff at The Thompson (Zoo) Manitoba, Patrick Cliche at the Université de Sherbrooke and Glen Lesins at Dalhousie University in Halifax. Content © 2010 (Université de Sherbrooke). Layout design by kty studio-plume.org for OSWD.